Welcome to the support topic of my snowglobe theme. A wintry theme with soft purples, blues and pinks, a lot of snow and a bit of a fairytale haze. This theme includes remodels of the categories, boards, info-centers, user profile and mini-profile. I have added two different avatars, various icons and a bit more shiny bb-code buttons. As icing on the cake you got slowly falling snowflakes on the entire forum. Enjoy! I've put a lot of effort in this theme, so please be so kind to follow them! You cannot remove the credits on this theme. Not the ones visible on the forum, neither the ones that are in the layout templates. 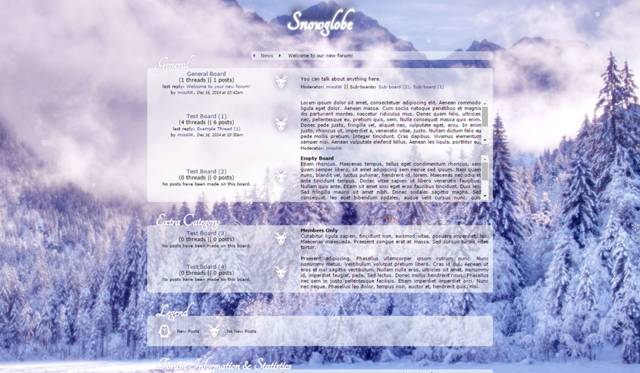 This is a heavily edited theme and as such a premade theme. You are not allowed to use this theme as base for your own work. Basically you have no permission to access and change anything in the Layout Templates and Style Sheet at all. 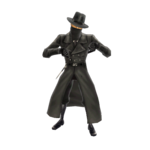 You are, however, free to change the avatars of this theme and update the contains of the mini-profile to your likings. For everything else, you have to contact me first. Please, I will probably say yes anyway and help you to accomplish whatever you like. Do not re-upload this theme in any way. I am the only one who will provide this theme for download. If you have any questions, ask! You can send me a pm, contact me on the proboards support-forum or reply on this thread. Some information about (optional) adjustments and the general setup of the theme. The theme requires the use of 150x150 sized avatars. You can upload these on your profile or on an external image hosting site. You'll find the content which appears in the welcome-message of your forum between the lines 55 and 59. The default hover content (for regular members) is placed between the lines 66 and 76. By default the mini-profiles of guests and deleted members don't have a hover. If you require one, you are free to change the entire template in such a way that they get one. If you don't know how to accomplish this, please send me a message and I will do it for you. Last, but not least: you can change the forum staff avatar (as shown in the welcome-message) by adjusting the url in line 29 of the mini-profile template. Because I couldn't fit them in neatly, I made the choice to hide them. However, you can find the code in lines 71-76 of the forum wrapper template (Themes > Layout Templates > Forum Wrapper). To get them to work again, you just have to remove the <!-- --> tags. However, the participated button seems to appear underneath the banner, so you can't click it. A quick / temporary solution could be to move the lines 71-76 to a new line between <div id="wrapper"> and <header> (line 62 and 63). That way the nav-tree will appear on top of your forum, and the participated button will work. An other (temporary) solution is to hide the button (<!-- $[participated_threads_link] -->) and enable it in the menu-bar (Settings > Forum Settings > Navigation). Providers of art and templates used in this theme. I'd like to use it. Yeah I commented those out, because I couldn't fit them neatly in. However, if you go to the forum wrapper template (Themes > Layout Templates > Forum Wrapper) you'll find the code in lines 71-76. Just remove the <!-- --> tags. Edit; i should have been more clear, the nav tree functions but, the participated thread button doesn't. Last Edit: Dec 20, 2014 2:06:33 GMT -8 by T.C. I think the participated button does appear underneath the banner, so you can't click it. A quick / temporary solution could be to move the lines 71-76 to a new line between <div id="wrapper"> and <header> (line 62 and 63). That way the nav-tree will appear on top of your forum, and the participated button will work. An other (temporary) solution is to hide the button (as you have done) and enable it in the menu-bar (Settings > Forum Settings > Navigation). As said, I will look into a better solution, but that can take some time. This is a quick fix, so you will be able to use the nav-tree + participated button. A quick / temporary solution could be to move the lines 71-76 to a new line between <div id="wrapper"> and <header> (line 62 and 63). That way the nav-tree will appear on top of your forum, and the participated button will work. This is my all time favorite theme! I am working on our forum with it here, but it is still a work in progress. Thank you, so much! hello! i absolutely adore the skin and couldn't resist making use of it, here! i also have a quick question; i'd like to use side tables to add more information to the page, however i'm finding that it is making the boards very narrow. i was wondering, is it a complicated process to widen the overall width of the boards, so that the side tables don't have such a devastating impact? there's a lot of free space on the sides of the boards, is there any way to utilize that? oh jeez, here i was thinking it would be so much more complicated than that! Is that alright? I do not believe I can fix this back to the original.